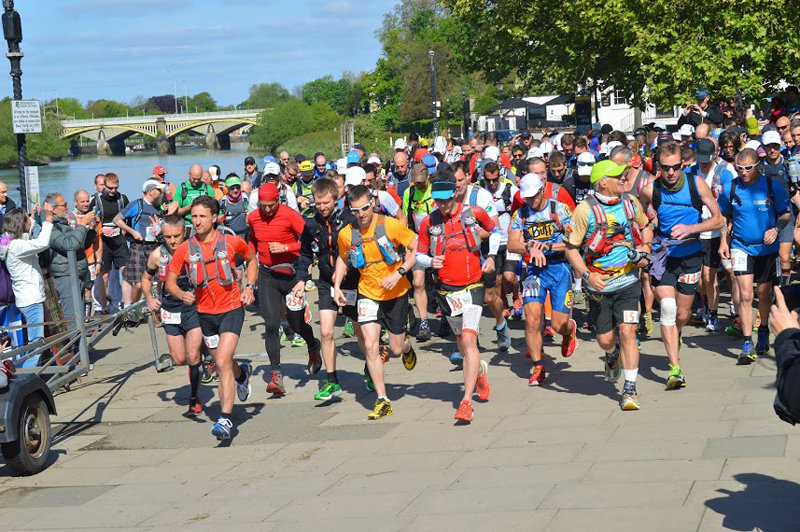 The Thames Path 100 was my main time focused race of the year as I wanted to have a crack at a sub 20 hour 100 miler which in Ultra terms to me is the equivalent of a sub 3hr marathon. In all honesty I don’t think I’ve run a decent 100 miler to date and with a familiar course and event, scheduled dry conditions and a good time of the year to run it was a good opportunity to have a go at this. The training for the year had started slowly, a knee injury over Nov-Jan hampered some of the running. A Thames Trot effort at the start of Feb was an hour slower than last year which meant I had some catching up to do. However, I had a really solid March where I banked a lot of miles (400+) and then a few races in April including a slightly unexpected marathon PB at London (3.13). 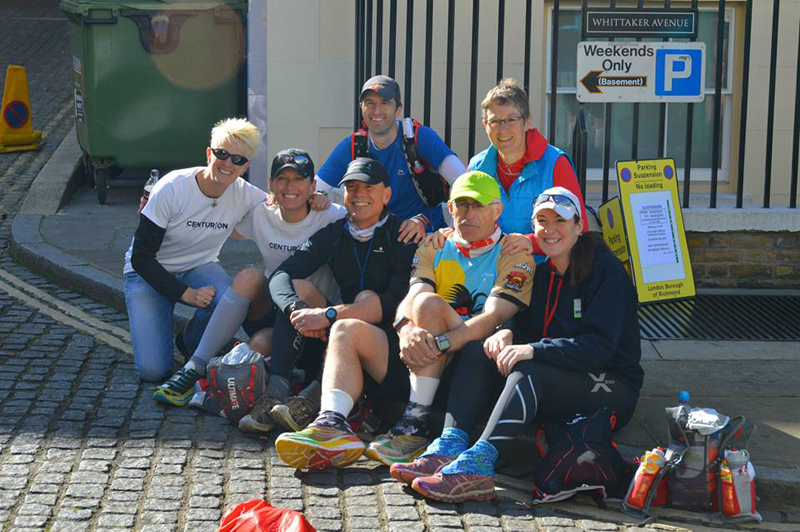 My last long run was the Enigma Good Friday Marathon a week London which went well and then I had planned a 2 week taper before this event when an unexpected knee injury struck when I was taking it easy. I could run on it but after each run my knee was stiff and sore and so I had to take a complete week off just before this event. 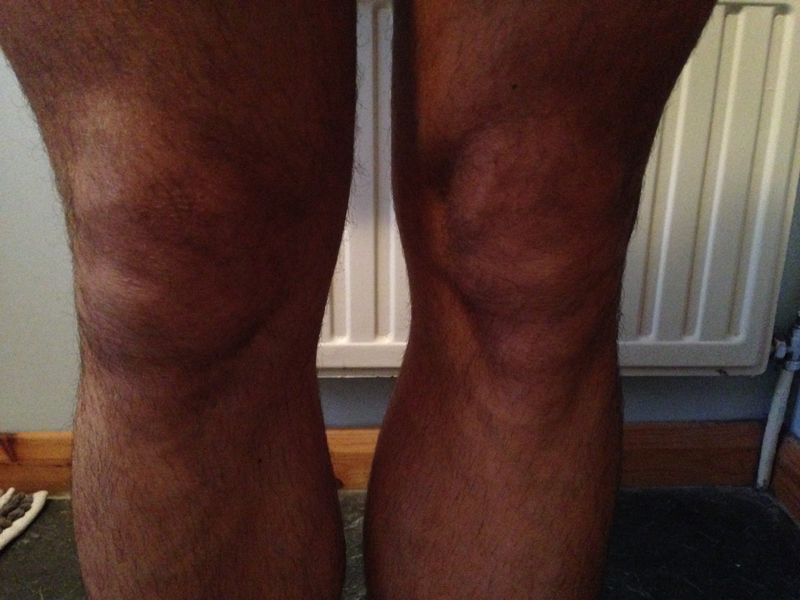 Swollen knee.. not what I wanted a week before the event! To say this was frustrating was an understatement, I was like a bear with a sore head the week before and moaned and whinged about the knee constantly in the build up to some of my running buddies (sorry). I wanted to be in perfect condition for the event and there was a little bit of uncertainty going into the race. In addition, with the TP100 being the first in the Grand Slam of Centurion events I didn’t really want to fall at the first hurdle and so I taped up the knee with some Rocktape in a marvelously unsubtle Union Jack colour and felt like a wrestler coming out to the squared circle all patched up “selling” his injury before the event started. 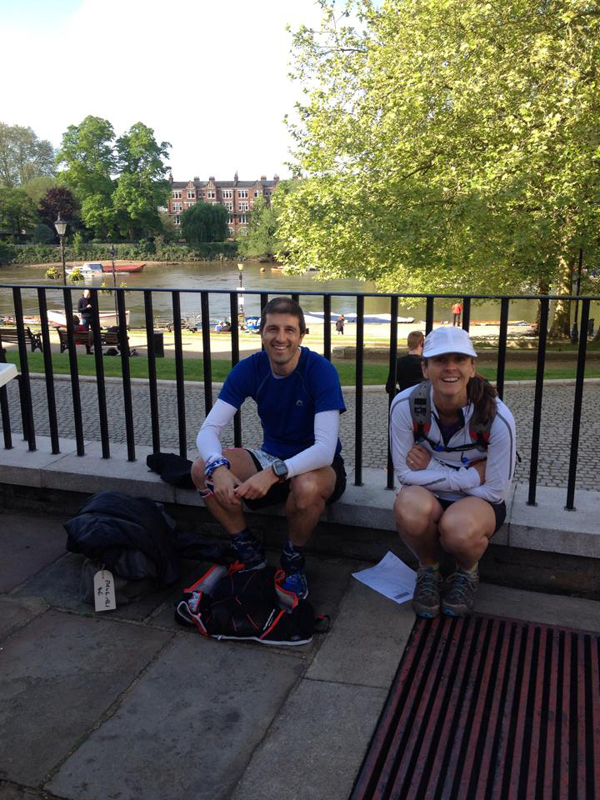 I travelled to the start of the event with Michael Sartorius who was also running and we arrived at Richmond in plenty of time, completed kit registration, got our numbers and readied ourselves for the start. In all honesty, my pack felt a little heavy. I was carrying all the mandatory kit but also packed some extra food, iPod, power charger, Garmin charger and a light weight jacket and could probably have cut down on some of the extra food as the Centurion checkpoints are well stocked and could have left a few other items in drop bags for when I needed them. 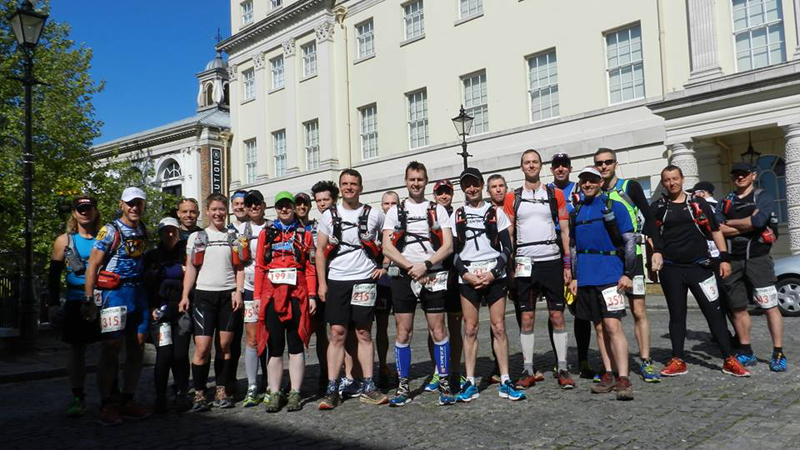 There were loads of familiar faces around (too many to mention here) and it was great to catch up with fellow runners, marshals and the rest of the Centurion community. There were about 40 or so people attempting the Grand Slam and a good half of us lined up for a picture just before the start of the race and then I made a quick dash to use the portaloo moments before the race started and got to the start line about 10 seconds before the start of the race (good timing) and then we were off. The plan had been to get to the half-way point at Henley (51 miles) between 8 ½ – 9 ½ hours leaving me 10 ½ – 11 ½ hours to do the second half allowing for some slowing over night. 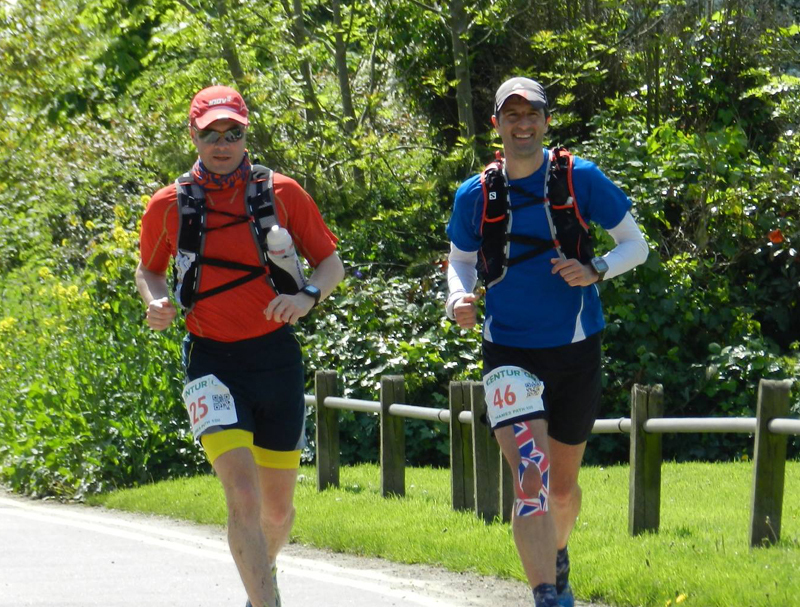 I had two pacers lined up, Stouty was going to meet me at Henley and run to Streatley and Matt was going to meet me near Benson and then run to the end. The weeks enforced rest probably did me some good, I had slept well the last few days before and had been on a caffeine diet 3-4 days before in the hope that some caffeine during the night through gels/tea/coke/coffee would keep me awake. I have a habit of getting pretty sleepy over night and stumbling around! I started off near the back where Michael and I found each other amongst the runners and headed off together only to be stopped by a massed group of runners waiting patiently to get past the first stile a few hundred yards from the start. 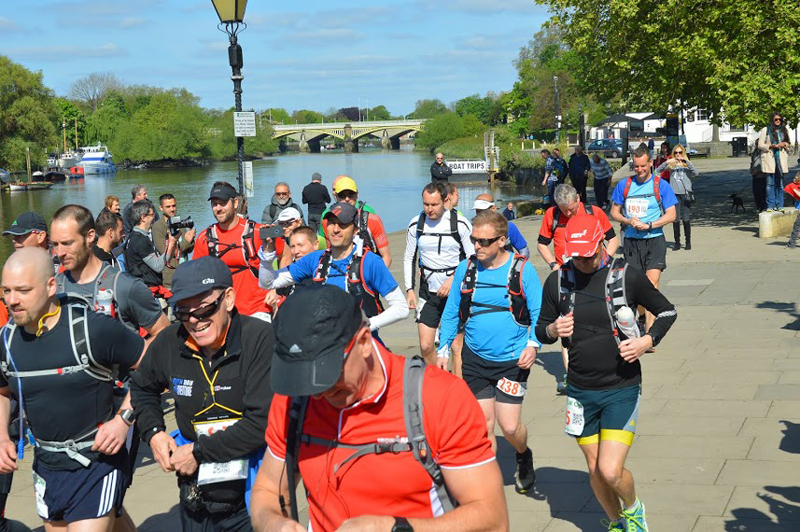 After this initial delay, we were on our way out of Richmond and heading towards the first checkpoint at Walton on Thames making 8.30 – 9m/m pace where Jen Bradley was volunteering. I grabbed some sandwiches and snacks and walked out from the Checkpoint eating my food to see Mary Heald out supporting her partner. After a brief walk break to eat some food, Michael and I continued onto the second checkpoint at Wraysbury. It was a glorious day, bright, sunny and quite warm as we made our way along the Thames Path. Despite using the portaloo moments before the start of the race which I thought would at least see me good for several hours, I need to use the loo again. Thankfully we passed a lock at about 18 miles with a toilet and I nipped in to use this as Michael trotted on. 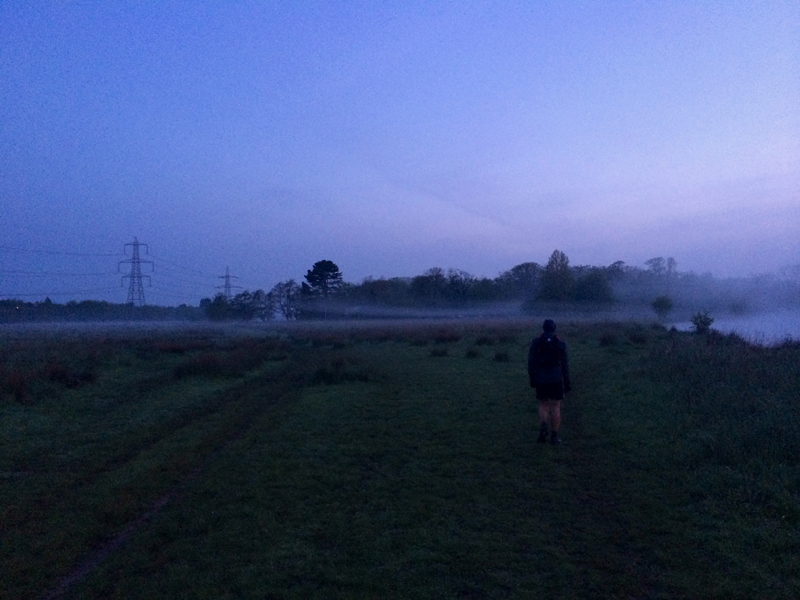 After use of the toilet, I splashed my face with water as it was feeling quite warm and trotted on maintaining an 8.30 – 9m/m pace until the second checkpoint at Wraysbury where I caught up with Michael. We had covered the first 22 miles in about 3hrs 20mins. I grabbed some more food, topped up my bottles and walked out of the checkpoint eating my food to see Mary Heald again and the second time she saw me walking and stuffing my face with food. “I have been running, honest” I offered meekly and walked on before picking up the running again. I had chosen to wear road shoes aiming for comfort as I thought would give my knee an easier ride. So far, we had travelled on some hard tracks and tarmac and I was pretty satisfied with this choice. Onwards to Checkpoint 3 at Dorney and I caught up with my lunchtime running buddy Matt Dunn and Sally Ford running together as we trotted on. I was maintaining a 9m/m pace and still feeling pretty good. I was taking an SCap! 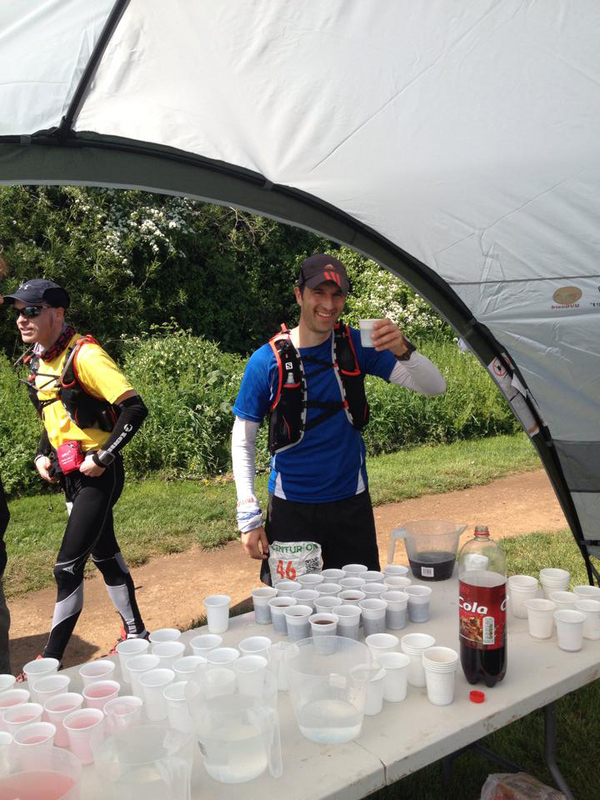 every hour, drinking coke at the aid stations and water in between and ensuring I ate something at every aid station. I must have drifted ahead of Michael around here as I ran by myself for a while with other odd runners around and bumped into Luke Ashton a couple of times. I had been shooting some odd video clips and some photos as per usual but found it a bit distracting and decided to just get my head down and run this one, so not much to add to the race video page I’m afraid. 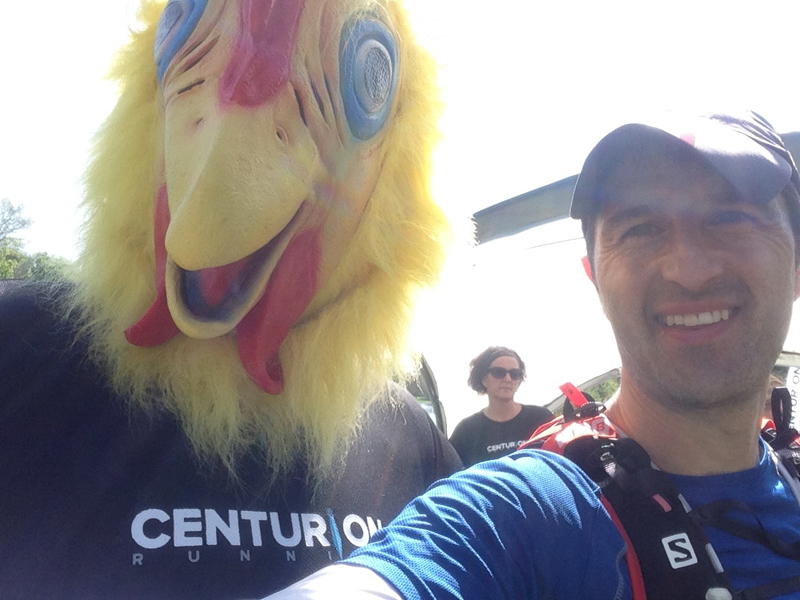 I arrived at the 38 mile checkpoint in 6.05 slightly ahead of my 6.15 – 7hr range and I think it was here where I bumped into Rich Cranswick dressed up in his Chicken outfit (I bet he sweated a few pounds off yesterday) and Nici Griffin grabbed this photo of me. After grabbing some more food and drink and taking another short walk break to eat the food on the go I broke into a run and headed onto the next checkpoint. Being “Chicked” during a run. I was pretty happy with what I had been eating and hadn’t really broken into any of my extra supplies I was carrying barring a handful of sweets. Unfortunately, this resulted in me needing the toilet again and I had to find a secluded bush somewhere, to do, well, you know what, again. 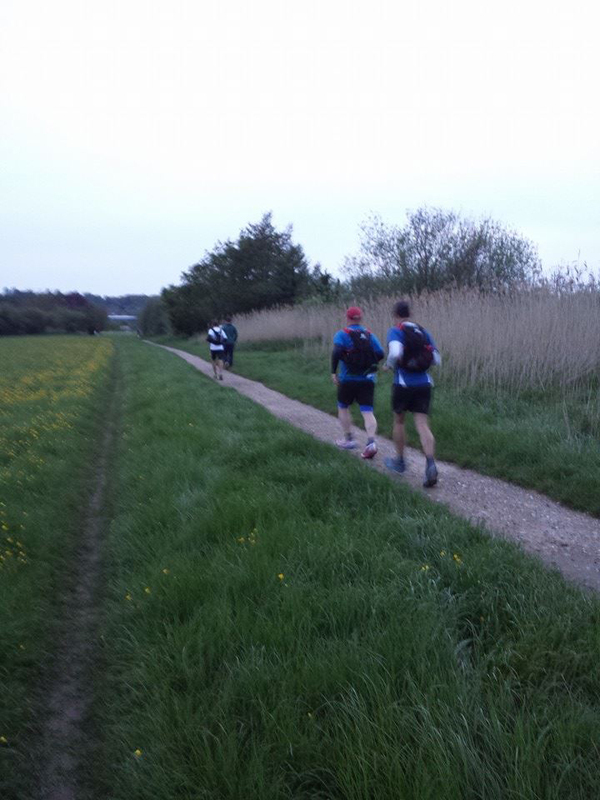 I was running around one or two guys as we headed towards Marlow when we I spotted Luke Ashton ahead having missed one of the crossing points. I shouted out several times but he didn’t hear me but thankfully a walker ahead ran up and relayed the message to him and he soon caught me up again a little while later thanking me for the shout out. My appetite had started to change since the last checkpoint and whilst sandwiches were easy to consume at the start, I had begun to gravitate towards fruit and melon as it was easier to digest. I passed through the Marlow aid station not stopping for long and not grabbing anything to eat as I had planned to have something more substantial at Henley, a little reward for getting half way and to ensure I had plenty of energy for the evening leg. I had a near comedy fall around here as I tripped on one of the many exposed tree roots, stumbling forward, one step, two steps, three steps as my face got closer and closer to the ground but thankfully I just about regained my balance narrowly missing a full on face plant although it felt as if I had wrenched my neck saving myself from the fall. The group of walkers I stumbled towards seemed reasonably amused. Stouty had texted me to see how I was getting on. I was slightly ahead of my schedule by about 10 minutes and he was a little concerned he might miss me but I slowed down between the Marlow and Henley checkpoint and the pace had dropped to around 10.30 m/m with a mixture of running and walk breaks. I arrived at the Henley Checkpoint having covered 51 miles in 8hrs 30mins and took a few mins to grab a freeze dried meal (Chilli & Rice) from my drop bag, drank a milkshake and a small bottle of coke. I said hello to Karen, Sue & Becky who were crewing and spoke briefly to Lindley who had also turned up to support some runners. Sue did remind me about sun-cream and this was when I noticed I had caught the sun a bit. I hadn’t really thought to pack some sun cream as I hadn’t expected it to be this warm particularly at a Centurion event! As my meal would take several minutes to hydrate, I decided to walk for a while and with Stouty in tow who was picking up pacing duties for the next 20 miles headed out of Henley. The first mile or so was a walk whilst I ate my food and we then settled into an easy paced run. This was the critical leg for me as I often fall into the easy option of running the first 50 and then hiking the second half. Today, I was determined to run more and so we ran the majority of the next leg interspersed with lots of short walk breaks. The next 20 miles is familiar territory for me as it runs through my home town of Reading, past my workplace and the area of my usual lunchtime run so this was good to sit in autopilot for a while. Stouty and I chatted for a while (he is extremely excited about the GUCR in a few weeks) and we passed the 100k point in 10.30 which was pretty healthy for me. There was a Beer Festival on at Reading, so there were a few more keen drinkers out and about near the river at Reading but we running most of this leg. We started to leapfrog Ian Thomas and another runner around here arriving in and out of Checkpoints at a similar time although we didn’t see too many other runners around to be honest. We passed through the Reading checkpoint quickly as I was still reasonably full from my recent meal and headed out again. We passed Ken Hughes near the Ibis Boatyward who unfortunately had to pull out from this event with an injury but kindly popped down to cheer on a few people. It was starting to cool down and get darker around here as the light eventually faded to darkness as we made our way towards Whitchurch and it was necessary to get the head torches out. The brief walk breaks were getting a little more frequent by this point. This section was the first wet and muddy section I had encountered all day as we headed out through Mapledurham and through some fields and my feet got soaked around here which started to feel a little uncomfortable. I was also feeling the cold a bit more and put on an extra layer I had collected at my drop bag in Henley. I was still on track for my target as I arrived at the Whitchurch checkpoint (67 miles) in 11hrs 40mins which was at the upper end of my 11.30-12.30 range so everything was on track. The last leg was the longest distance between remaining checkpoints at 9 miles and we had slowed a bit. As Stouty was leaving me at the next Checkpoint I wanted to finish on a bit of a high and knowing the next Checkpoint was only 4 miles away we made the effort to run all of this leg… except for a couple of hills as the route diverted away from the river for a little while. We arrived at Streatley where some hot food was on offer and I wolfed down some beans and potatoes, had another bottle of coke and a cup of tea. I also dug out a small envelope I had prepared for Matt Dunn with a motivational message for him after he bailed at my aid station at the NDW100 last year. “That’s really kind of you” said one of the chaps marshaling when I asked if they wouldn’t mind passing it on. “You haven’t seen what I have written in the envelope” I replied with a cheeky grin. (It contained a picture of Matt feeling rubbish at the NDW100 last year with a message saying something to the effect of “Don’t f**k it up”… actually that was the exact message, I know, I’m all heart but I thought it would give Matt a laugh). I didn’t tarry to long here and headed out by myself with Matt Brown my next pacer planning to meet me at about the 80 mile mark after the next Checkpoint. As I had about 10 miles by myself, I took out the iPod and put an audio book on to give me some company as I left the Checkpoint thanking the marshals for their support. The Streatley to Wallingford section followed more fields with wet grass resulting in soaking wet feet again. I had taped my feet in advance but could feel one or two blisters on the toes but knowing there was more of the same terrain ahead I judged it not being worthwhile to change my socks and for the first time I was going to cover 100 miles without a sock change. Matt actually met me before the next checkpoint having tracked me down on my phone and ran/walked up to a suitable meeting point. He was standing near a gazebo placed in the middle of a field which I had assumed was the next Checkpoint but it happened to be some people having a summer evening out. I think they had lots of people approaching them assuming they were a Centurion Checkpoint in error. It would have been amusing to see someone walk up and start helping themselves to their food and drink! Matt and I jogged/walked the next few miles to the Wallingford checkpoint at 77.5 miles (although it was slightly longer as there had been a diversion in place around Benson). We also overshot the small right hand turn into an alleyway just prior to the Checkpoint and saw a runner ahead also looking confused about the directions. I knew there was a right hand turn but we had simply missed it in the dark. We backtracked our steps and the found it with no harm done really. The next leg from Wallingford to Clifton Hampden was the worst of the entire race for me, it seemed to take forever, I was starting to feel the cold now and I was running out of steam. To be honest this leg felt like a long walk with little or no running. I had started to feel sleepy and took one of my “Hero”mints (a caffeine infused mint sweet) to keep me awake. We also missed the crossing at Days Lock. Once again I knew where the crossing was but as we arrived at the Lock the crossing point was closed and so we went on ahead but came to a dead end. Having retraced our steps back to the Lock, we discovered the crossing point mere yards behind the one we checked, which I couldn’t believe we missed. However, by that time 4 or 5 other people joined us in the mis-direction so it wasn’t just us! It was misty, cold and wet underfoot as we trudged on and on until I finally spotted Rich Cranswick again in full Chicken costume just before the 85 mile checkpoint. I was pretty relieved to get to this Checkpoint to have a cup of tea and sort myself out. Matt kindly grabbed the teas and a pile of biscuits, which I dunked and ate quickly. I put on an extra layer, warm hat and got a warm drink inside me before we headed out again passing the lead lady as we exited the checkpoint. 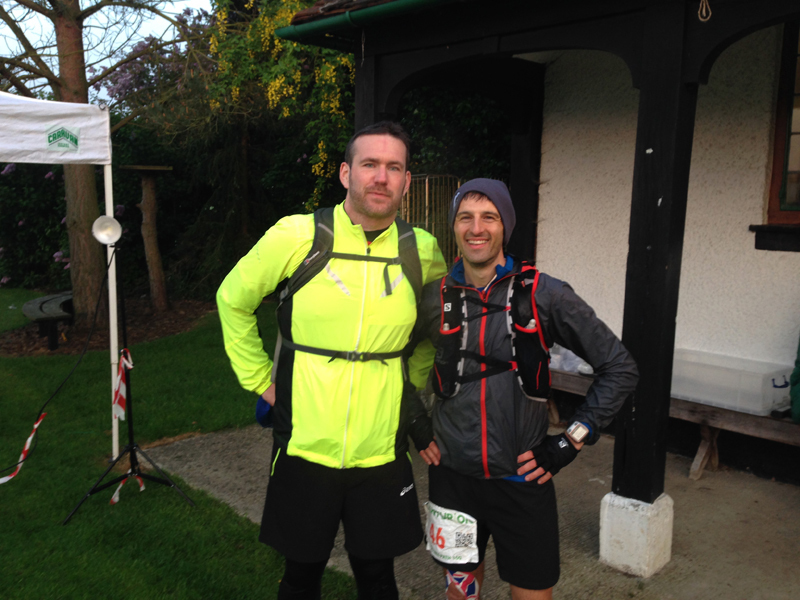 I had covered the 85 miles in 16hrs 28mins, which had slipped right to the end of my 15.10 – 16.30 range. I knew we had lost time in that last section and knew we had to make some up. We jog/walked as much as we could. I underwent a self assessment then, the knees were creaking but not hurting, the right calf muscle was a little sore, I had warmed up after a bit of running and I wasn’t actually feeling that tired so the caffeine hit was working. Essentially I could still manage a run and it was simply a case of giving that mental effort time and time again to keep driving forward and keep trying to break into a run. Matt and I continued on. I knew the sub 20 was a little tight but had quite quickly decided to make the effort to claw back some time now rather than leave it too late. I wanted to get enough time banked and earn some breathing space at the end in case I was reduced to a walk and so we trotted on with occasional short walk breaks but trying to keep these to a minimum. There wasn’t much conversation largely down to me as I was just focused on trying to run and kept distracting my mind by repeat counts up to 100 in tandem with each step forward. We arrived at the Abingdon checkpoint where Ashley was crewing, had another quick cup of tea and several biscuits and then headed out as a few more people arrived. It was only 4 miles to the next Checkpoint and 5 miles to the end after that. Matt and I both had comedy falls during this section. It was still dark and muddy as I tripped over something and landed on my side, thankfully nothing was bruised apart from my ego. We made some time up here with a 5mph pace and arrived at the final Checkpoint to see Paul here crewing (Blackbird Leys Boy). We didn’t stay at all and I said a quick hello before we pressed on towards the finish. 95 miles and we were nearly there, it was starting to get light with that early morning cold and mistiness along the river. We continued up with the effort to run as much as we could with frequent walk breaks and it was really a stop start effort from this point onwards. Matt got this really cool photo of the mist almost splitting in two like a jet stream (see below). 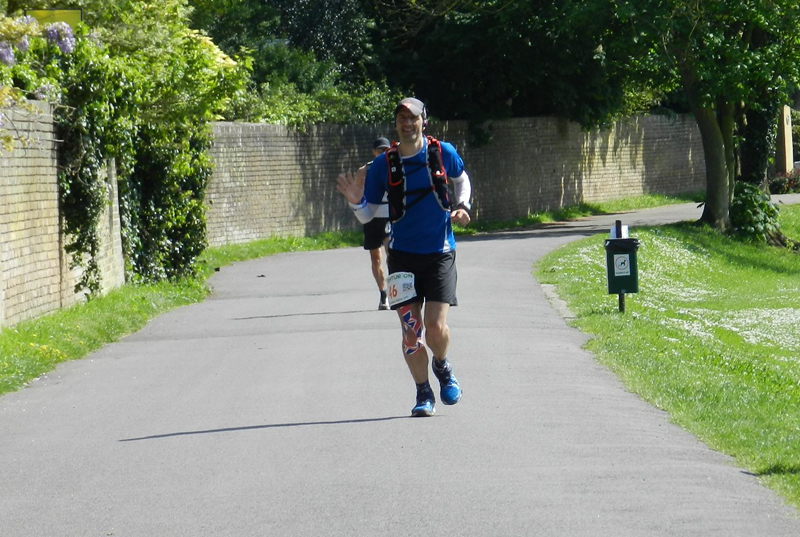 A new PB was secured when I had to stop for another proper toilet break (my 4th since the start of the race) and a short while later we hit a proper path marking the stretch towards Oxford Town Centre. Jay Macdonald came past us shortly afterwards, I was slightly thankful it wasn’t a few minutes earlier when I was using the bushes. I was flagging a little towards the end but by that time knew the sub 20 goal was pretty secure. We finally saw the turn off into Queens College and the finishing line as Matt stepped to the side to allow me to jog to the finish where there was a small crowd of people. The crowd seemed to be getting a little excited towards the end and I thought Matt was mucking about behind me but turned to see David Ross charging towards the line. I was close enough to the finish to cross the line slightly ahead with David right on my tail and finished in 19hrs 36mins and a new 100 mile PB by about 3hrs. I hadn’t really kept track of positions at all as I was guided by a time goal but pretty pleased to see I had finished 13th out of 280 ish starters, so a pretty decent result for me. There was a big hug from Nici followed by the award of the buckle and t-shirt before I saw Matt Dunn at the end. I was momentarily confused as I was wondering how he had got ahead of me and then realisation sunk in… he hadn’t made it to the finish and I felt bad about leaving the motivational message. Unfortunately Matt had suffered during the night and was pulled from the race and hadn’t even received my er “warm words of encouragement”so let’s just keep that between ourselves, ok? His partner Sally however, finished in the next hour or so as 2nd lady which was a fantastic for her. I was pleased with the result having achieved my target (that’s another 2014 goal completed). There was a little niggle over the poor 77.5 – 85 mile section but I can’t really grumble with a 3hr PB at all. In addition, I was happy to have run a lot of the second half of the race and was pleased that physically I was still able to sustain a run, it just required a huge mental effort to keep driving yourself forward minute after minute during the night. Even better news was that I didn’t suffer at all with the sleep demons so my tactics seem to have worked for the first time. Thanks to Stouty and Matt for their pacing efforts which definitely helped and well done to all the Centurion team and volunteers for putting on another high quality event. It was great to see loads of familiar faces running and helping out. The knee was pretty sore for a couple of days after the run as I hobbled around but now seems to have settled down. I have a few weeks before the GUCR so will hopefully be well rested and ready for the next race. Congratulations on finishing strong on this race and great coverage! Thank you for reviewing. It’s great to hear that you made it through the finish line at the 13th even after all the trouble that came your way. Hope your knees are all better now!